The Professional Institute of the Public Service of Canada (PIPSC), along with the Union of Concerned Scientists, marked the Government of Canada’s Science and Technology week with an advertising campaign which included an open letter to Prime Minister Stephen Harper. The letter states: “Canada’s leadership in basic research, environmental, health and other public science is in jeopardy…We urge you to restore government science funding and the freedom and opportunities to communicate these findings internationally”. The letter was signed by more than 800 scientists from 32 countries, from institutions such as Harvard Medical School in the U.S. and the Max Planck Institute in Germany. 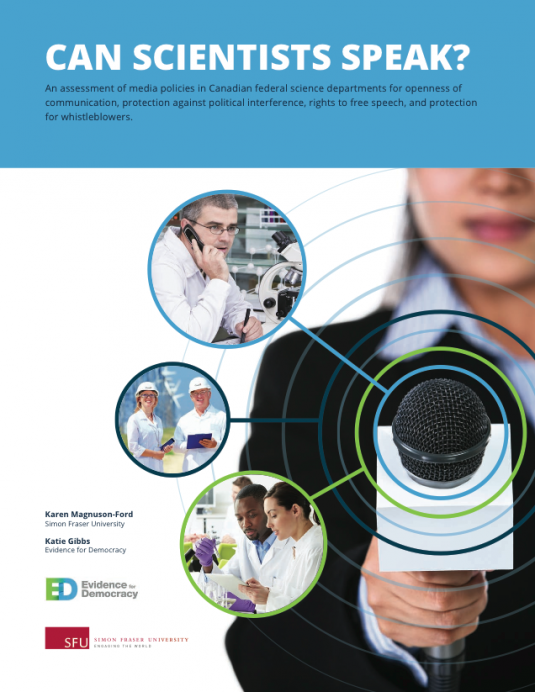 PIPSC, which represents scientists employed by the federal government, has published earlier surveys of its members to document their perceptions of being “muzzled”; a related advocacy group, Evidence for Democracy, released its own report on October 8, compiling and ranking the communications policies of federal government departments. The world has seen this before, as described in a blog by the Union for Concerned Scientists, and coincidentally, by the New York Times obituary on October 19, 2014 for Rick Pitz. Pitz was a U.S. whistleblower who exposed the subtle manipulation of scientific reports on climate change in the Bush administration between 2002 and 2003. Ignoring the opinions of federal government scientists has its perils. On September 23, the Quebec Superior Court issued a temporary injunction to stop TransCanada’s exploratory drilling for the Energy East pipeline. Part of the reason for the injunction: environmental groups provided internal documents showing that scientists from the federal department of Fisheries and Oceans had been raising concerns for months about the impact of the exploratory drilling on the habitat of threatened St. Lawrence beluga whales, and of the proposed oil terminal that would be built to service 250-metre long supertankers. The court ruled that, by ignoring the scientists’ concerns, Quebec’s Minister of the Environment erred in issuing a permit for the exploratory work. See the CBC report at:http://www.cbc.ca/news/technology/foreign-scientists-call-on-stephen-harper-to-restore-science-funding-freedom-1.2806571 for links to previous stories in this ongoing issue. This entry was posted in Uncategorized and tagged Climate Science, Energy East, Environmental Science, Evidence for Democracy, Muzzled Scientists, PIPSC, Public Science, Science Funding, TransCanada, Union for Concerned Scientists by Ava Lightbody. Bookmark the permalink.